Dana is a moderately-active dog who likes to enforce the rules for her owners. While she’s opinionated about how things should be, she listens well to correction. She has experience herding horses, sheep and chickens using shouldering, soft-mouthed nipping and the occasional bark to get her point across. She will return animals to their pens on her own and will alert her owners to escapees. Extremely conscious of her property boundaries, Dana stays at home even when tempted by running rabbits. She keeps her territory free of vermin, eliminating the ones she can catch and chasing the others away. 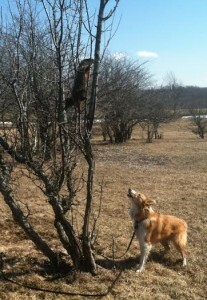 Dana hunts by tracking and will bark treed until someone comes. Dana is welcoming of visitors and delivery people, but doesn’t like strange dogs in her territory unless properly introduced by her owners.